I know what you've been thinking: "Susan, you live in Astoria. Where the hell is the Greek food?" Cut me some slack, people. I've only been at this for three weeks. 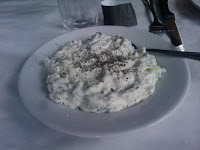 But to keep you guys happy, Dr. Science and I had our Saturday lunch at Aliada, the closest Hellenic joint to our house. We sat at one of the outside tables to enjoy the warm early fall day. 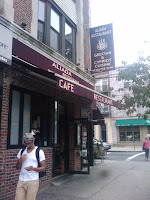 Although Aliada's outdoor space is perfectly attractive, it suffers from the same problem as all Astoria sidewalk cafes: it's on the sidewalk. In Astoria. This means we saw a lot of cars making three-point turns in the middle of traffic, and heard a lot of horns honking as a result. Whether this counts as atmosphere depends on your taste. Getting back to the food: the trick to eating veggie at meat-and-fish-centric Greek restaurants is to order lots of appetizers. Our server kicked things off by bringing us a complimentary dish of spicy hummus and warm pita triangles. We followed that with thick, garlicky tzatziki (yogurt-cucumber dip, for the uninitiated), which is so filling and delicious that I've actually made a dinner out of it on a number of occasions. The spanokopita, sadly, was less successful. 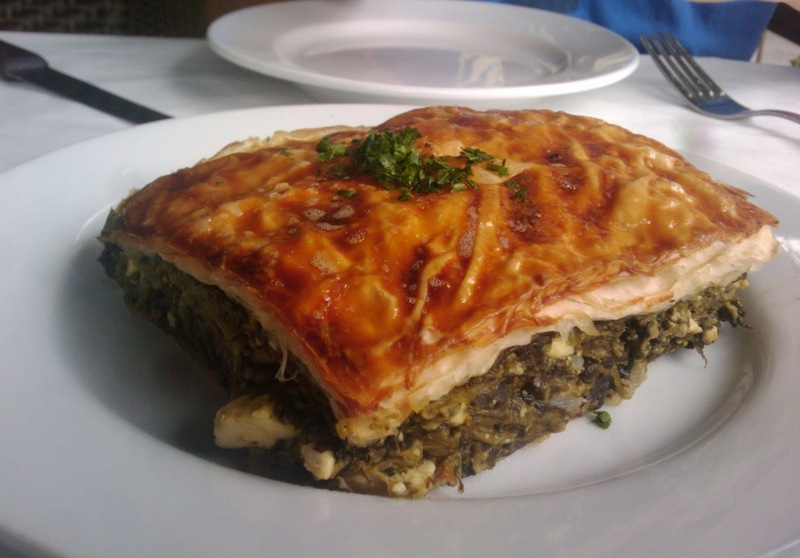 It looked pretty and the spinach-feta filling was tasty, but the soggy layers of phyllo on top dragged it down. 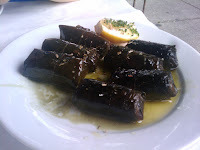 The dolmadakia – grape leaves stuffed with rice and herbs – were also disappointingly mushy. As for meatless entrees, Aliada offers exactly two: spinach kanellonia and the ancient Athenian delicacy known as falafel. 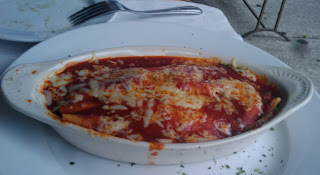 We went for the kanellonia (that's "cannelloni" in English, or perhaps Italian) – crepes stuffed with spinach and feta and topped with a spicy tomato sauce and melted kefalograviera, a pungent sheep's milk cheese. Dr. Science and I both gave this one an "opa!" As our side dish, we ordered lemon potatoes, which, in a carb addict's dream, arrived on a bed of rice. 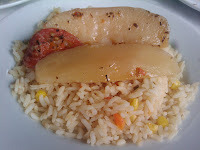 The potatoes were tangy and perfectly cooked; the rice, unfortunately, was studded with tough little kernels of corn. Portions at Aliada are more than generous; after four appetizers and an entree, we didn't even consider dessert. Even so, dessert arrived, compliments of the house. (Our server must have suspected I was some sort of reviewer, since I wasn't all that discreet when I snapped photos of the food.) We're pretty sure it was galaktoboureko, a custard baked in phyllo. It wasn't terribly memorable, but hey, it was free. The total bill came to $38, including tax and tip. So – not bad, but not exactly a trip to Santorini, either. In the future we'll probably stick to takeout tzatziki. 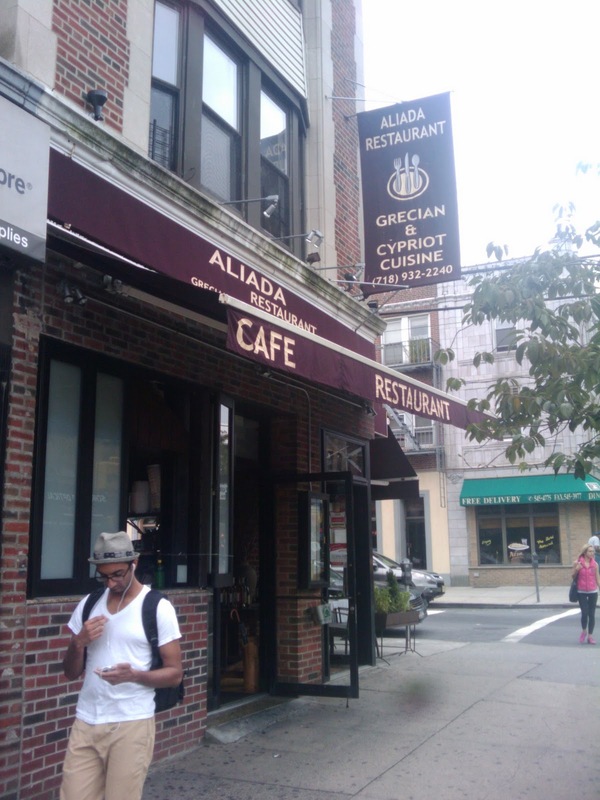 "Although Aliada's outdoor space is perfectly attractive, it suffers from the same problem as all Astoria sidewalk cafes: it's on the sidewalk." Zenon Taverna has even better veg.-friendly cypriot/greek options! But as a fellow veggie Astorian, I always enjoy Aliada's halloumi sandwich, horiatiki salad and a glass of wine. Light and flavorful -- definitely one of the better meals to be had along Broadway in Astoria. Thanks, City Spoonful! Never been to Zenon -- will give it a try.